1. Place pork in a ziplock bag with orange, lime and lemon juices, oregano, garlic, 1 T of olive oil and onion. Marinate for 30 minutes-1 hour. Remove pork chop from marinade, pat dry and reserve. 2. Preheat oven to 400 degrees. In a medium saute pan over medium-high heat, add the remaining olive oil. Saute pork chop until golden brown on one side. Add remaining marinade to the pan and transfer to the oven, cooking to medium, about 8-10 minutes. 3. Slice and toast ciabatta roll. 4. Mix mayonnaise and Dijon. Spread on the bread, and top the spread with pickles. Slice the pork thinly and place on the roll. Drizzle the reduced marinade over the pork and top with cheese. 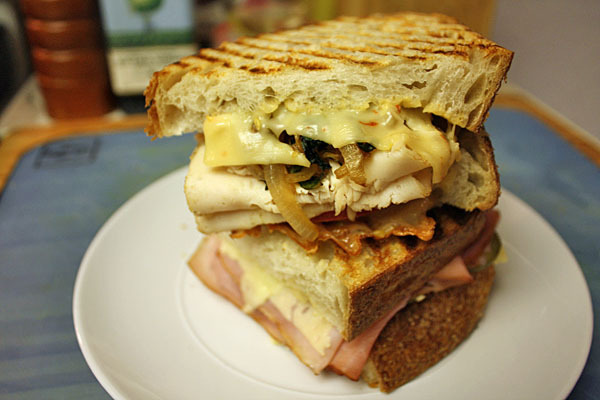 Place the sandwich back in the oven to melt the cheese, about 30 seconds. 5. Remove and serve. Enjoy!